Discover the Foods that Fight Disease and Help You Achieve Better Health! The foods you eat have the power to help you live a longer, healthier life. Choose the right foods and you’ll fuel your body with the nutrients it needs to prevent nearly every disease and dysfunction from cataracts, infertility, and neurodegenerative conditions to cardiovascular disease and cancer. But just as the right foods can help your health, the wrong foods (think: processed) can increase your risk of heart disease, type 2 diabetes, high blood pressure, and more. that have the potential to make you stronger and healthier. You’ll get the inside scoop on nutrition myths that can harm your health such as, saturated fats are no longer bad for you ... coconut oil is a veritable cure-all ... you should eliminate carbs from your diet ... meats are the only source of complete proteins ... and dozens more. You’ll find tips for creating healthy meals with what you have in your pantry ... Easy and delicious ways to get more vegetables into your diet ... 6 secrets to smarter snacking ...Plus you’ll get a Special Bonus Section at no extra cost with 17 mouth-watering, healthy recipes. Make sure you’re making the right food choices for your good health. 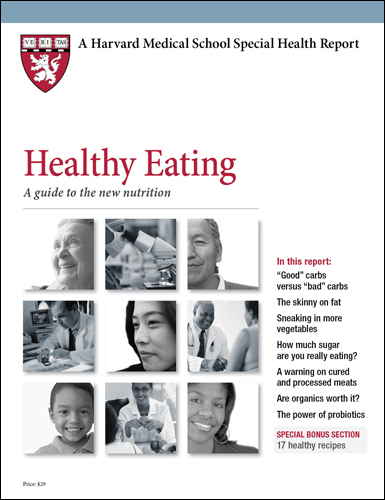 Order your copy of Healthy Eating: A guide to the new nutrition today. Does your diet deliver the recommended dose? Surprisingly, given the demonization of both fat and carbohydrates in the media in recent memory, the quest for a healthy diet does not begin with drastically reducing either one. In fact, fat, carbs, and protein all play important roles in the body. Collectively, these three food components are known as macronutrients because the body requires relatively large amounts of each of them (as opposed to micronutrients—essential vitamins and minerals—which are needed in much smaller amounts). The key to a healthy diet does not hinge on eliminating any of them, but on picking the best sources of all three. In the lingo of the popular media, there are “good” and “bad” carbs. Similarly, there are healthful and not-so-healthful sources of fat and protein. The more you can tilt your diet in favor of the beneficial ones while reducing the others, the better off you’ll be. It may sound like a daunting task sorting out one from the other, but it’s easier than you’d think. The first rule of thumb is simply to stick with whole foods as much as possible—that is, foods that most closely resemble the natural food. We don’t mean you should eat everything raw. Cooking is fine. Recipes are fine. But start with real ingredients—fruits, vegetables, nuts, whole grains, fish, eggs, skinless poultry. The more a food has been processed before you purchase it, the more goodness has likely been stripped away. The second rule of thumb is to increase the amount of plant foods in your diet. Research increasingly shows that a diet based on fruits, vegetables, legumes, and whole grains is healthier than one based on large quantities of meat. Rather, think of meat as an accompaniment, not the centerpiece of your meal. The third rule of thumb, of course, is to limit your calories, so that you don’t put on a lot of excess weight.